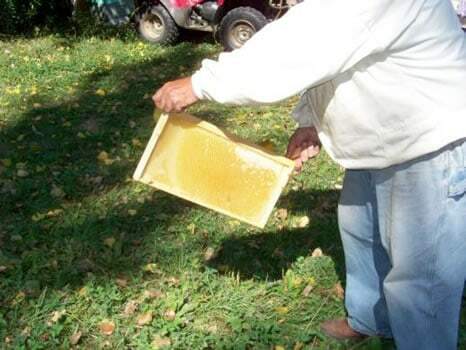 Grampa Jack’s Honey is made right here on Hoch Orchard. 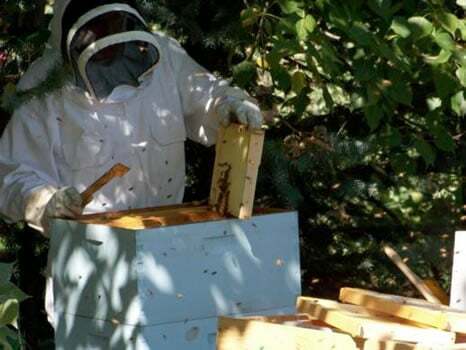 Jack and Mary Anne Redfearn wanted a retirement project to keep them busy and out of trouble, so a few years back Jack asked if they could put a couple bee hives on the farm. They are farmers at heart and started off in the Dairy and Hog business many years ago. They left the farm decades ago and joined the world of city folks. After working in many cities around the country, they moved back to the La Crosse area to be close their son and grand kids. Jack found us a few years ago when we advertised for a part time delivery man. If you worked at one of the many coops we delivered to you surely remember Jack. He always has time for chat or kind word. If you got to know him a little better you would get a wise comment or a flat out teasing. Grampa Jack is not one you forget. Jack is not delivering to the coops anymore but he still spends a lot of time on the farm. We even lured his wife Mary Anne up here after the greenhouse she volunteered for went under. Mary Anne takes care of our farmer’s market sales and does a lot of our store demos. Her real job is Honey extractor and bottler. After a couple of years playing around with a handful of hives we decided to make a business of it. 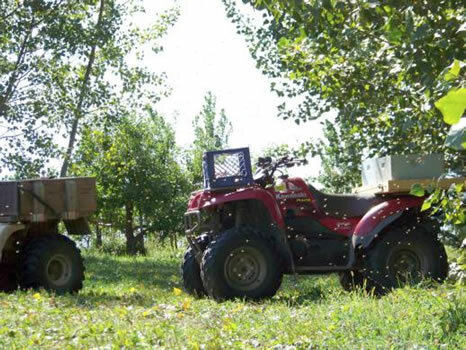 Now Jack and Mary Anne take care of between 15 and 20 hives on the farm. These hives are moved around the farm but don’t ever leave the property. 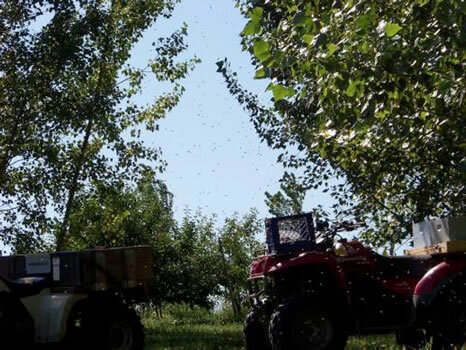 We don’t rent the hives to other farms; our bees have plenty of work to do here at Hoch Orchard and Gardens. Our fruit plantings flower as early as April with the apricots and don’t finish until June with late strawberries. Our orchards are full of flowering clovers and many other plants that provide nectar all summer long. Johanna and Jack with new bees ready to go to hives that are waiting in the orchard. 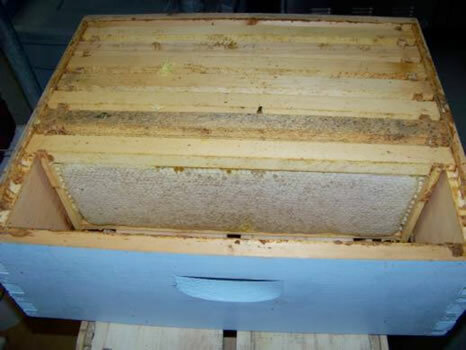 Our bees are raised in a low input system. 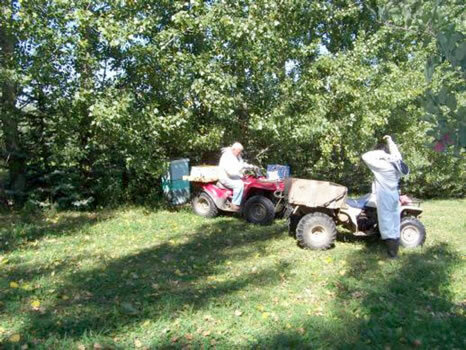 We do not treat the hives with synthetic miticides, or give them medicated water and high fructose corn syrup. Sometimes Jack will give them a boost of water with a little organic cane sugar added. He will also occasionally sprinkle powdered sugar over the bees in the hive. 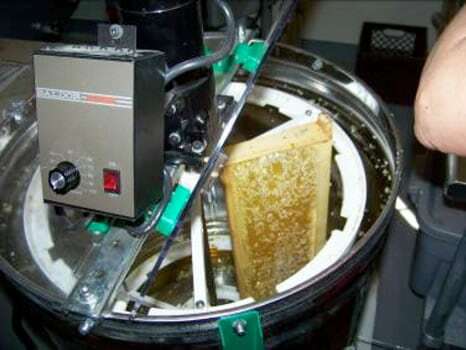 This stimulates the bees to groom themselves to get rid of the sugar granules and in the process the remove any mites that may have jumped on for a ride. The hive boxes are brought to the loading dock and from there are carried into our kitchen where the frames are taken out. 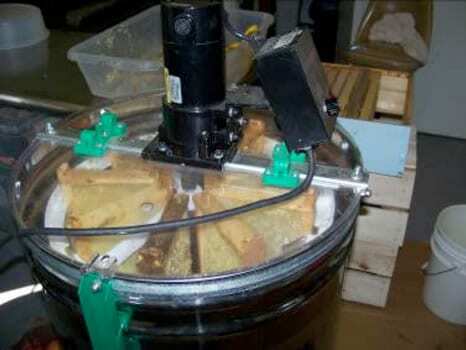 The wax caps on the honey cells are then opened and the frames are put right into the extractor. 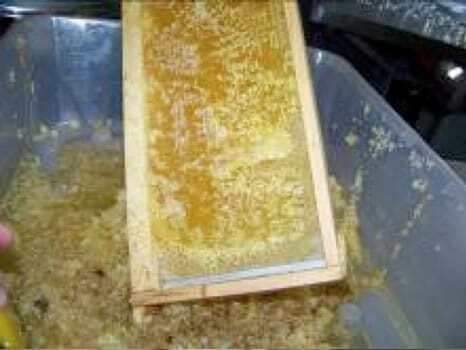 The honey is spun out of the frames and collected into pails. 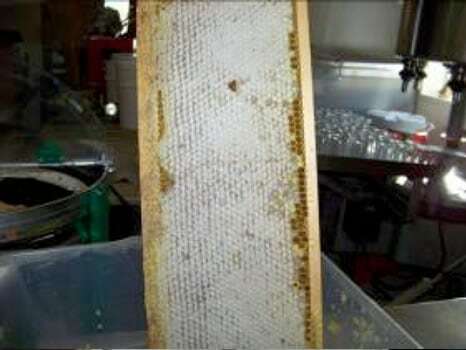 We then run the fresh honey through a single filter screen and back into a pail. 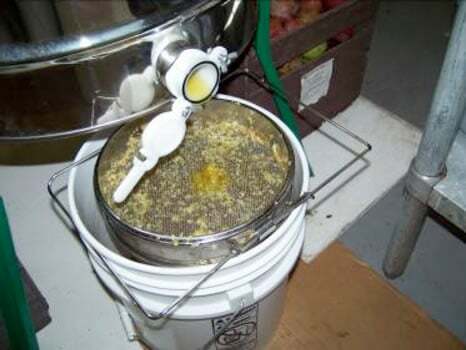 We hold the honey in 5 gallon pails until we are ready to bottle. 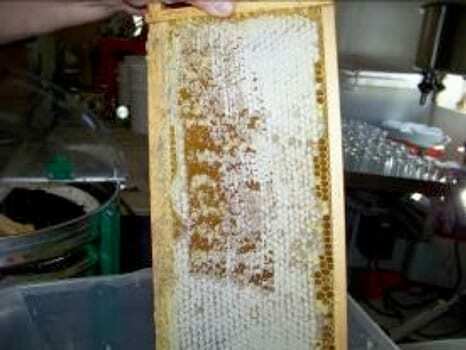 We don’t heat the honey to extract or filter it. It takes a little longer this way but it preserves that natural smooth texture of raw honey. Our honey is NOT certified organic. It is our only product that is not certified. 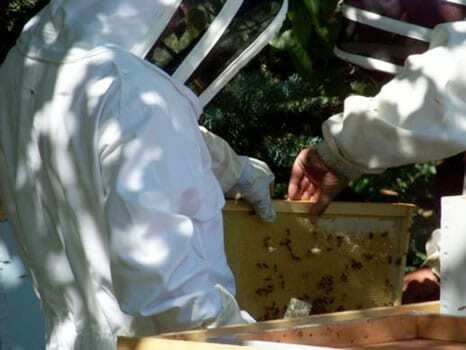 We cannot certify our honey because of the Organic Standards require a ten mile buffer between an organic hive and any neighbors that may use pesticide of some kind. This requirement is the reason it is so hard to find organic honey from the United States. Most organic honey comes from South American jungles where there are no conventional farmers. We cannot guarantee that our bees won’t leave the farm, but we can’t figure out why they would! For special treat, put a couple jars of Grampa Jack’s Honey in the back of the pantry and leave it there for a few months and let it crystallize. Our raw honey does not get hard and grainy when the crystals form. The honey turns creamy white and becomes firm with a fine smooth texture that you can scoop out of the jar and spread like warm peanut butter. Be sure not to heat up Grampa Jack’s Honey if you like the butter. Once you heat it, you will not be able to get that fine smooth texture again. It will recrystalize into a harder form more like conventional honey will. If you don’t like the creamy honey you certainly can warm it up so it is thin and clear again. Grampa Jack’s Honey, no miticides, no medications, from bees kept on our organic farm. Extracted and filtered without being heated.